The WPRichSnippets plugin allows you to add some extra details to spice up your review post or page via the Rich Snippets post meta box. The Pros and Cons details are optional and it has no effect to the page markups. In the Details tab, you can add Pros and Cons, enable the display of Cons and Pros, and also enable Disclaimer link to show on the Box. The disclaimer link should be added via the plugin settings. 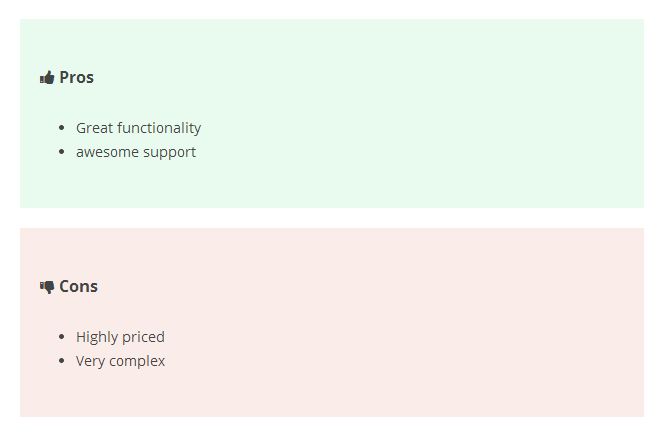 Values of Pros and Cons fields are displayed automatically on the entry Box, but you can disable the auto display and use a special shortcode to display it anywhere you want in your entry body. (The shortcode can be found under the Help tab within the plugin settings page). Use shortcode [wprs-pros] to display Pros. Use shortcode [wprs-cons] to display Cons. This setting can be used to display a note on the Box with a link to your disclaimer page. (The disclaimer link should be added via the plugin settings) This is a good idea to tell your website visitors about paid reviews if you have any.